The low-profile UltraBattery maker confirms a major government project. Ecoult emerges out of the shadows with another grid-scale battery project. 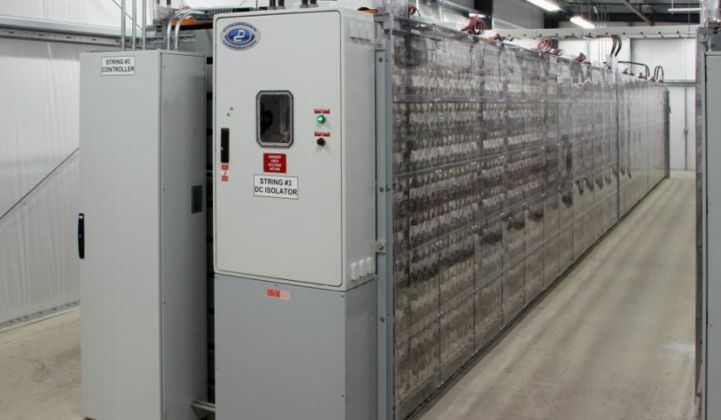 Ecoult, the advanced lead-acid battery maker, is back in the grid-scale energy storage game with a 2-megawatt project for an unnamed government client. The project is the first megawatt-scale project for the low-key Australian manufacturer since it installed a 1-megawatt battery for ancillary services, peak shaving and emergency backup on the PJM Interconnection grid in 2016. “This project is significant and combines the opportunity to benefit from revenue for the provision of ancillary services when the grid is operating with the ability for the facility to island from its own renewable and diesel resources if the grid fails,” said CEO John Wood. Ecoult sells a unique supercapacitor-plus-lead-acid-battery combo called the UltraBattery, or "UltraFlex" for units up to 20 kilowatts, which excels at cycling with a partial state of charge (PSOC). It has only installed a handful of large-scale systems over the years, though. Its first major deployment was a 1-megawatt, 500-kilowatt-hour plant installed at a wind farm in New South Wales, Australia. This went live in 2011, a year after Ecoult was purchased by U.S. lead-acid giant East Penn Manufacturing. The installation and new ownership helped Ecoult expand in Australia and the U.S. In June 2012 it commissioned a 3-megawatt, 43-minute-duration behind-the-meter demonstration plant, at East Penn’s manufacturing site in Pennsylvania, to serve the PJM market, according to data from the Department of Energy’s Energy Storage Database. And the following year it installed a 3-megawatt, 32-minute-duration project on King Island in Tasmania and a 500-kilowatt system, tied to a 250-kilowatt, 1-megawatt-hour Deka Synergy advanced lead-carbon battery from East Penn, for New Mexico utility PNM. The company has been very quiet in recent years, however. Ecoult’s only other major project, the 2016 PJM plant, came and went with little fanfare. The company’s website hasn’t listed any news since Ecoult was selected for an Indian off-grid power program in February 2017. At the time, the company told GTM it had around 12 megawatts and 12 megawatt-hours of capacity on the ground. To date, Ecoult has installed around 60 systems, mostly in the 20-kilowatt to 100-kilowatt range, said Wood. In the U.S., meanwhile, Ecoult’s North American director of business development and services, John Buchanan, said there's plenty of interest in the brand. Buchanan said Ecoult is also seeing “high interest from the Caribbean and Puerto Rico” for stable and reliable battery storage. Will this interest translate into sales, though? On the grid-scale side, few project developers have chosen the UltraBattery since 2013. The King Island plant owner, Hydro Tasmania, switched to Toshiba lithium-ion titanate batteries for its next major project, located on Flinders Island. Meanwhile, a 2015 report on the East Penn project, produced by Sandia National Laboratories for the U.S. Department of Energy, found that the batteries experienced significant variations in cell temperature in the course of frequency regulation. “Cell temperature management has been a challenge throughout the project,” it said. Even in the absence of operational wrinkles, it is a hard market for companies touting non-lithium-ion chemistries. This fixation has claimed a number of scalps, including Aquion, Alevo and, most recently, ViZn Energy Systems. Thanks to East Penn, which owns the world’s largest single-site lead-acid manufacturing plant, Ecoult has the backing to avoid a similar fate for the time being. Wood said the company is working to improve the performance and cut the cost of the UltraBattery technology, with a 40 percent battery and module-level reduction in price per usable kilowatt expected in the year up to December 2018. In a market all too often filled with hype, slow and steady is good. But Ecoult will need to make sure it doesn’t miss the battery boat altogether as lithium-ion vendors cram on board. 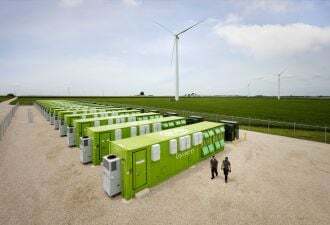 Will energy storage replace peaker plants? Join GTM & Wood Mackenzie at our new event as we gather industry experts from energy storage, utilities and gas industries to examine technological and regulatory developments, business model innovations, and investments in peaker resources. Learn more here.